1. The smashed frame is mainly used to support the eccentric shaft (spindle), the slab and to withstand the crushing force. Commonly cast steel (such as ZG35) is cast out in one piece, or assembled in parts, and can also be welded with thick steel plates. In order to increase the rigidity, it is generally provided with longitudinal and transverse reinforcing ribs. 2. Smash the eccentric shaft (nickname spindle) to support the moving jaw and the flywheel, to withstand bending, torsion, and crank function. The eccentricity is generally 10 - 35mm, which is the most expensive part of the machine. It is usually forged by high-strength high-quality alloy steel such as 42MnMoV, 30MnMoB and 34MnMo, and the small one is also made of 45 steel. Generally need to be treated by quenching and tempering. 3. Broken jaw plate (crushing plate) and protective plate. The jaws with teeth in front of the rack and the pair of side guards on the inner side of the frame form a square pyramid crushing chamber. The slab and the slab are directly in contact with the crushed material, and are subjected to strong crushing force and friction and wear, so they are generally made of wear-resistant materials. 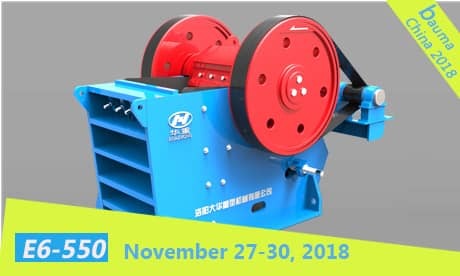 Commonly used ZGMN 13 or expensive high manganese nickel molybdenum steel, small-sized jaw crusher in small and medium-sized factories, also commonly used for white cast iron. 4. The function of the smashing thrust plate (liner) is to support the moving jaw and transmit the crushing force to the rear wall of the frame. When the rear end of the thrust plate has an adjusting device, it can be used to adjust the size of the discharge opening. In design, gray cast iron materials are often used to determine the size of the material according to the conditions of self-breaking under overload. The thrust plate is also a kind of safety device, which can automatically stop working when there is no overload in the work, so that the discharge port is enlarged to protect the expensive parts such as the moving boring, the eccentric shaft and the frame from being damaged. Therefore, do not change the material and size of the original drawing without special reasons. 5. The broken work table is equipped with a seesaw (broken plate), which is usually cast with ZG45 and ZC35, and the upper part is supported by an eccentric shaft. The bearing has a sliding bearing, some use a rolling bearing and the lower part is supported by a thrust plate. . The working table is set with a toothed crushing plate and fastened with bolts. Pay attention to the anti-loose. In order to reduce the weight and increase the sturdiness, the squat is made into a box shape, and the bottom of the squat is pulled at the bottom of the shackle. The mounting angle of the mounting is usually 150 - 250.